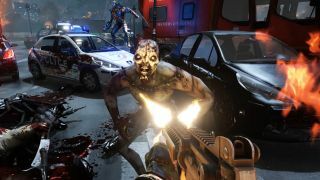 Killing Floor 2, despite what the title suggests, is not about killing floors. Going by the new trailer released today, it's actually about killing pretty much everything but floors. And it's now out on Steam. The Early Access release will include three levels—Burning Paris, Outpost, and a "reimagined" version of the Biotics Lab from the original Killing Floor—along with four perks, 27 weapons, 11 Zeds, seven playable characters, a new boss, and the SDK for mod creation. It supports both solo play as well as co-op action for up to six players. Tripwire plans to add new maps, monsters, perks, weapons, and game types during the Early Access period, and will "hone and refine the gameplay balance" based on feedback from players. The studio promised a "breadth" of free content for Early Access buyers that will carry over to the full release, and said that post-release free content is planned as well. With the Early Access version out the door, Tripwire is now tackling various technical issues, details of which are available here. Of particular note, based on the fact that it's written in boldface and all-caps, is, "Do not use the dedicated server tool in your Steam library." Set up a proper dedicated server instead, which you may learn about from the Killing Floor 2 wiki—and speaking of learning things, don't miss Evan's essential Killing Floor 2 guide, "Ten Tips For Being a Better Zed Killer," right here.